Palace of Duke Leon Sapieha. Ruzhany, Sixteenth Century. 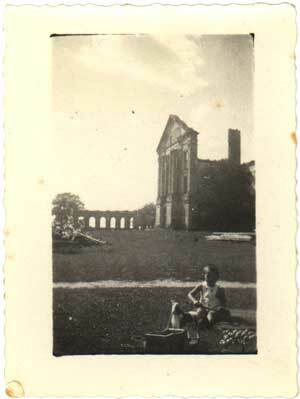 Photo from Tomasz Wisniewski Collection; reproduced with permission. 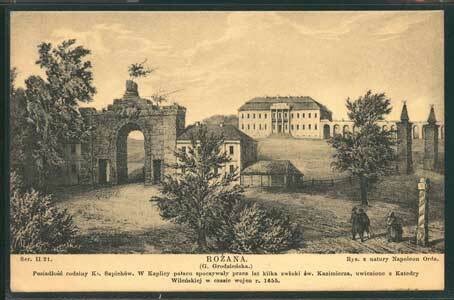 The castle was purchased by Ari Leib PINES [born in Volkovysk about 1787] from Duke Sapieha, December 21, 1829. Ari Leib was a financial advisor to the Duke and the founder of the textile manufacturing concern carried on very profitably by his descendants in Ruzhany. 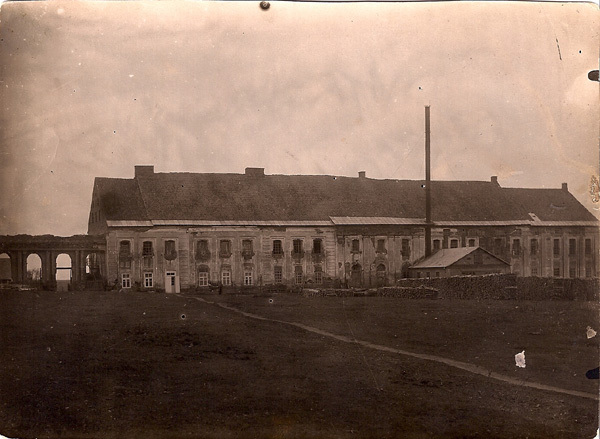 The PINES family occupied the castle continously through World War I. 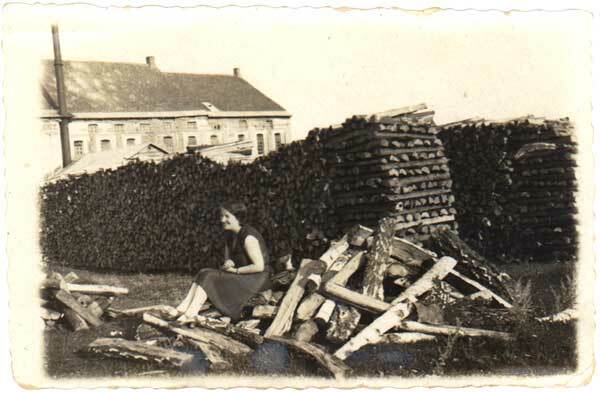 [My grandmother, Golda, was born and grew up there, among others.] 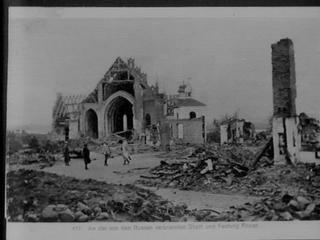 Some time during World War I ( in the year 1915), the castle burned down as a result of a fire inadvertently caused by washerwomen. 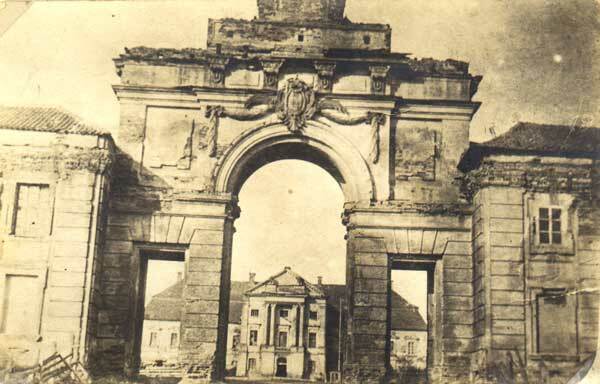 The ruins are still standing, and the triumphal arch at the entrance to the property is clearly visible in recent pictures. The PINES family was quite charitable and very Zionist: Yehiel Michel Pines, the Israeli pioneer, was a descendant. Other Pines descendants live in Israel today, as well as in USA and Canada. Photo courtesy of the Oren family, Israel. 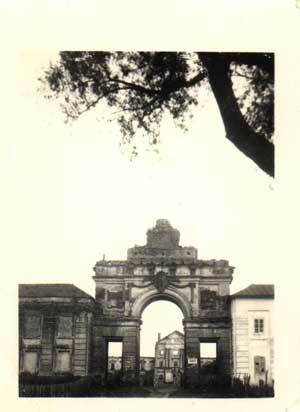 1932 - Ruins seen through the main entrance. Pines factory for wool. Stood at right anlgle to the palace. 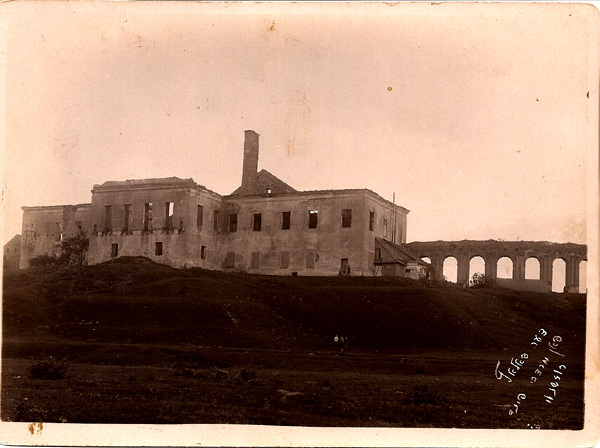 A castle that was burnt by the Russians before they withdrew their troops during World War I. It looks like it is from the inside, the opposite direction of the pictures above(RFA's comments). 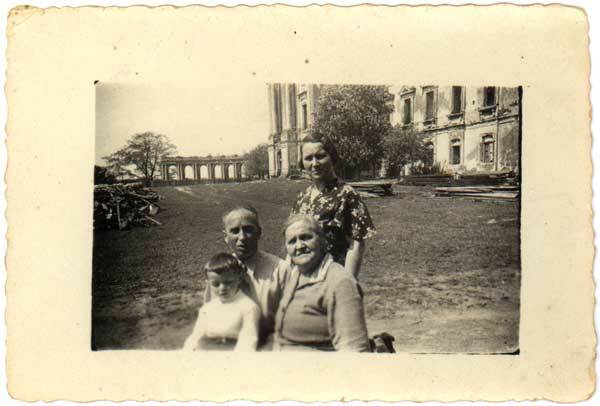 The following pictures of the palace are from the records of Dora Vegotsky Pitkowsky, mother of Sarah Platt, aunt of Edith Vegotsky Taylor, Co-coordinator of the Ruzhany Yizkor Project.